Thousands of demonstrators hit the streets of Budapest for a second night over the passing of a series of bills that critics argue will cement Hungarian Prime Minister Viktor Orban's grip on power. Orban's right-wing party Fidesz pushed through legislation on Wednesday that allows employers to demand up to 400 hours' overtime annually and the creation of a new government-controlled court system, sparking protests and clashes with police. Thousands returned to Hungarian capital's streets on Thursday night to intensify their objections to what has been dubbed the "slave law." Angry protesters marched across Budapest's Széchenyi Chain Bridge with banners reading "Free Country, Free University" and "To prison with this gang of thieves" before the sea of angry people caused traffic chaos on nearby streets. The protests follow two recent legislative initiatives by Orban: one that allows employers to force employees to work more overtime, the other the creation of a parallel courts system known as administrative courts to deal with cases related to corruption and free speech, among other issues. 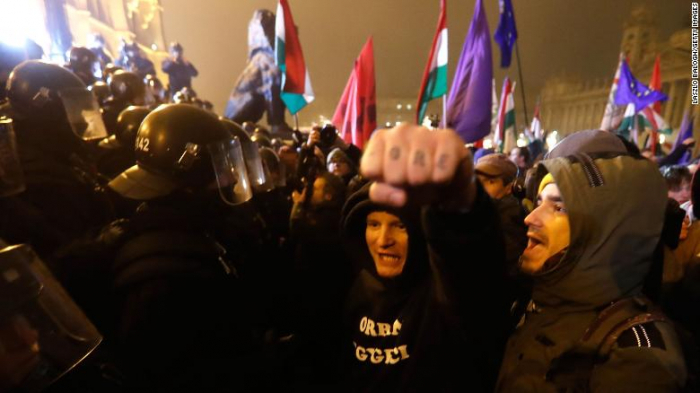 On the steps of parliament, scores of police officers in riot gear blocked the building's entrance as demonstrators assembled before them, waving flags and colored smoke flares while chanting "Orban go to hell" and "We have had enough," Reuters reported. "One thing is the issue of the courts, which is the next phase of cementing their power, one phase towards building total power," protester Tamaz Szabo told the news agency. "I've come to show a huge middle finger to the government and express that I am really, really fed up and I think most people are here for this," said another student protester, Adam, who declined to give Reuters his surname.